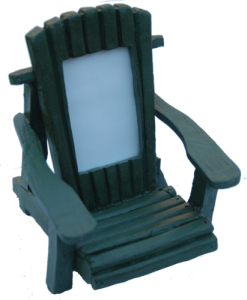 Adirondack chair photo frame will hold a 2x3" photo and can also double as a cell phone holder. Adirondack chair photo frame will hold a 2x3" photo and can also double as a cell phone holder. The chair measures 5" H x 4.5" W, the distance between the arms is 3.10". Real wood look resin material, available in green, white, red and natural wood color.